We are Toad Testers for The Toadstool which means we get to try out toys and share them with our readers. 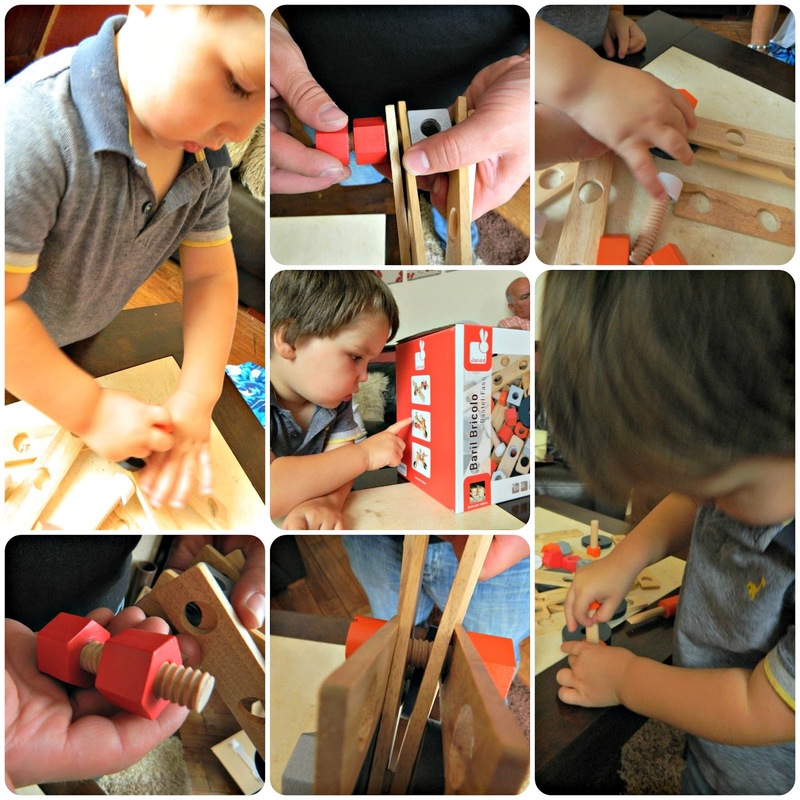 Obviously trying out toys is lots of fun and we're very pleased to share our latest review, the Janod My Own DIY Barrel, with you. Janod is a favourite toy brand of ours, we love their range of wooden toys, puzzles and games. The Janod My Own DIY Barrel is a rectangular box (not actually a barrel, the packaging seems to have moved on since it was named) which contains 45 pieces of wooden construction kit. 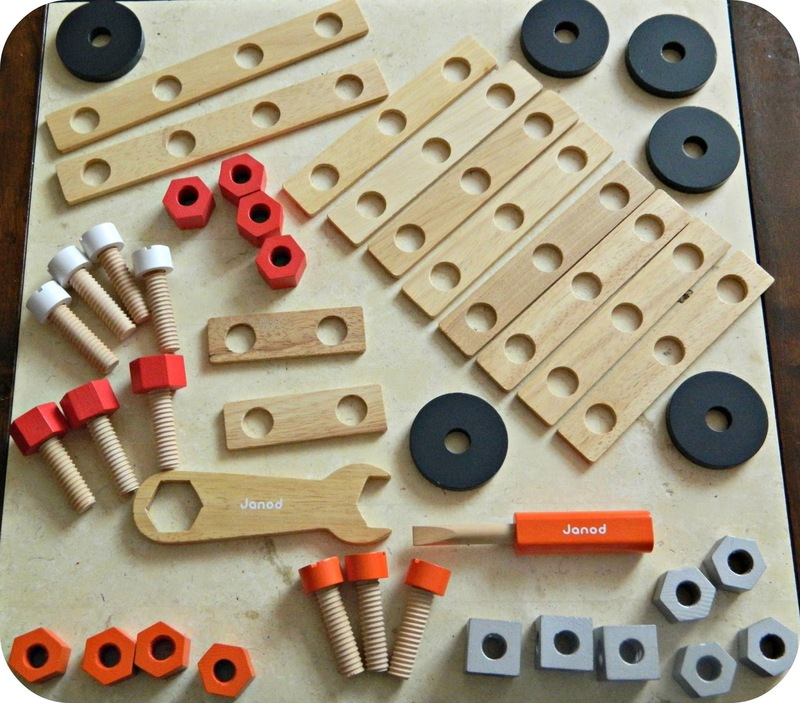 There are wooden strips with varying numbers of holes, discs, screws and bolts, in addition to a screwdriver and spanner to help you put your models together. If you imagine a construction toy like Meccano, made in wood with larger pieces for smaller hands, you have exactly the idea. The box is well constructed, complete with carrying handle so all of the pieces just pop back inside for effective storage. It's really high quality and I would have no concerns about it deteriorating over time, a pet hate of mine is those toys with lots of pieces like this, where the box just doesn't stand up to the job of being opened and closed, put away and got out again, over a period of years. I have no concerns about this one. Each component is crafted to the highest standard and constructed from a mix of Rubberwood, Birch and MDF. I've been over every piece and have no concerns at all about splinters or the pieces deteriorating, they are really high quality.The colour palette used is quite muted but this allows the quality of the wood to shine through, it is a much more attractive set than similar plastic toys I have seen and has no risk of pieces breaking or snapping. Bud is three and I thought that this would be the perfect toy for him and his Daddy to share and I was right. If I get this toy out for him on his own at the moment he isn't so interested but, when his Daddy plays with him he really loves it. 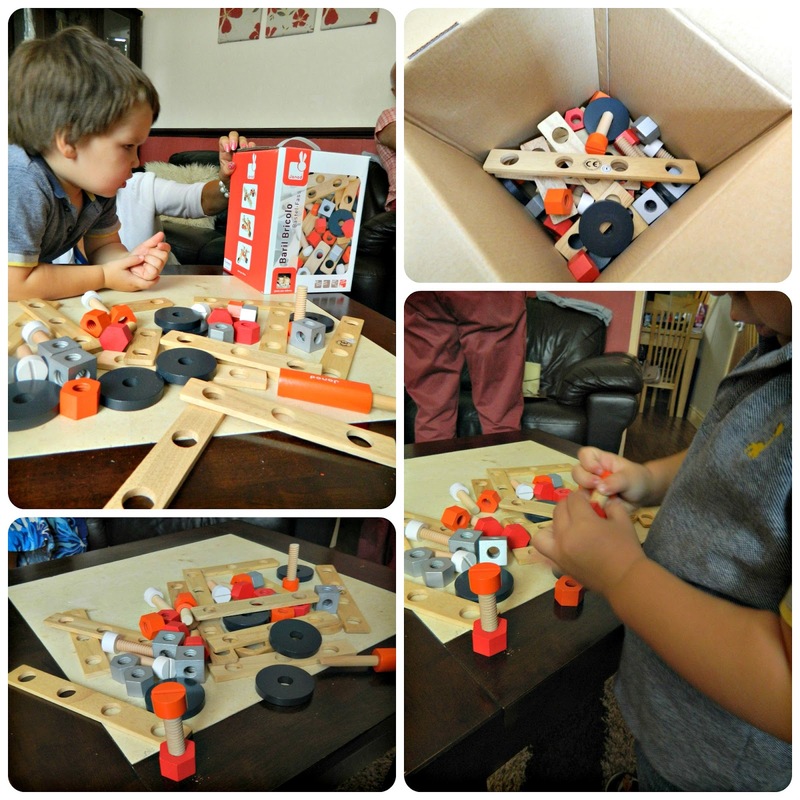 The Janod My Own DIY Barrel encourages hand eye coordination, role play and imaginative play and as soon as we get the box out I see two heads bent over the construction of a new toy. If I get the toy out when Bud is playing alone he quickly wanders off to do something else, I think he will engage more on his own with it when he is a bit older. We had two older children round a little while ago, aged 5 and 7 and they played with this for ages, having called many other of Bud's toys 'for babies' or 'too young' so I'm sure we will get years of enjoyment from this toy. His 10 year old cousin will even play with this, and he's used to much more elaborate construction toys. The Janod box has three clear photos of suggested constructions - two motorbikes and an aeroplane - and these have been constructed many times now, as well as a variety of our own ideas and creations too. I would love it if the barrel came supplied with a booklet of construction ideas, to give more ideas for next steps but, similarly, it's good to encourage children's own ideas too as the pieces and tools provided offer a blank canvas for creativity and imagination. Bud will make simple shapes if left alone but really enjoys making more complex structures with Daddy's help. Bud has some outlandish requests for his Daddy and I so enjoy watching them struggle over requests like 'make a helicopter Daddy! ', sometimes 45 pieces isn't quite enough! We're really enjoying playing with the Janod My Own DIY Barrel and I feel like it will give Bud (and Little Miss when she is older) years of enjoyment in the future. It is a high quality toy with exactly the level of production I associate with Janod. I'm looking forward to seeing him play differently with this toy as he gets old, it really will grow with my children and present new play opportunities and challenges as they get bigger. The Janod My Own DIY Barrel is available from The Toadstool for the bargain price of £17:50 at the moment. I think this would make the perfect gift for a child aged four to six, or for a younger child in a family that enjoys construction toys. Disclaimer: We were sent this toy for review purposes, all thoughts and opinions are my own.